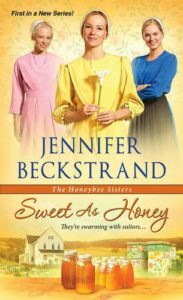 Sweet As Honey by Jennifer Beckstrand is a delightful Amish novel and the first book in the Honeybee Sisters series. I loved it. The minute I began reading, I just knew that Sweet As Honey was speaking straight to my heart. The characters were all wonderful – from the three Honeybee sisters to the handsome Dan to the feisty Aunt B and even the cat Farrah Fawcett. There is an energy in the novel and it’s humour is infectious. As the reader I really felt that I was witnessing the story unfold rather than just reading a tale. There is an overwhelming sense of love and family in the novel. The characters live out 1 Corinthians: 13 – their love is inclusive. Everything they do is motivated by love. Gotte was at the very heart of the novel. The sisters were all practising Amish. Their Aunt B had lived among the Englisch for twenty years. The two world’s do collide at times as Aunt B with her strangely coloured hair and her tattoos does not fit in to the Amish view of appearances. “They (the Amish) were suspicious of her colourful hair and her tattoos and her fondness for having conversations with Gotte in public places.” This reminds the reader that God does not look at our outward appearance, He is far more concerned with the state of our heart. The novel deals with the theme of verbal bullying. Years of abuse can make a person feel worthless as they believe the words spoken over them. “She was starved for confidence.” Our worth is never found in another person but in God. “You will never find out what God wants for your life by asking another person.” It is always important to believe what God tells us and to listen to Him. Within the novel there is a strong work ethic. The family pulls together to harvest the honey. They work as a well oiled unit with everyone knowing exactly what is required of them. The story has the theme of growing confidence and breaking free from the restraints of the past. With love and kindness, characters can begin to bloom. I absolutely loved As Sweet As Honey. I particularly liked the humorous Aunt B with her shotgun and meat cleaver. Her attempts at catching a mouse were particularly funny. I loved the way her dialogue bounced off the other characters. Jennifer Beckstrand has a delightful way of writing so I can ‘see’ the characters and settings. I am walking through the novel rather than just reading. I cannot praise Sweet As Honey highly enough. It’s such a wonderful novel in which I became totally engrossed. I would normally feel sad when having finished such a fabulous novel but as I know I have books two and three to follow – bring it on! I know what I’m reading next! I’m currently in the middle of reading this book – I absolutely loved Jennifer’s Huckleberry Hill series! A cookbook would be great!